Growing up, fish was not a regular occurrence at my Mother’s supper table. My parents having moved to Canada to start a new life and family here had to make the most of everyday meals. Fish at the time was a fairly expensive item that didn’t keep well and didn’t make for great leftovers. The lingering smell of fish in the kitchen probably didn’t help convince my Mother to cook it often either, (to help get rid of the smell we light a beeswax candle! ).This is why fish-centric meals were usually reserved for special occasions or weekend meals when my parents both shared in the cooking. 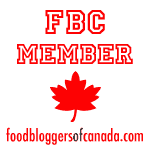 This baked haddock recipe using fresh Nova Scotian Haddock is one dish I always enjoyed watching them prepare. 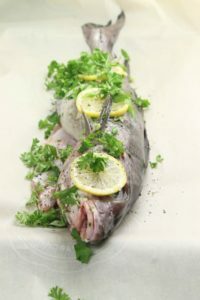 There was something magical to me about this whole slippery fish being washed and seasoned, wrapped up with lemons, white wine and herbs, and being transformed into a delicious, delicate, and flaky meal. 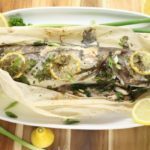 Baking the whole haddock in parchment has several advantages to pan frying haddock, or deep frying it. Haddock is a fairly delicate fish when compared to salmon or halibut for example. Due to its delicate nature, the less you have to move or handle the fish while cooking, the less the risk of it breaking apart and drying out. When the fish breaks apart, more of its surface is exposed to heat, therefore drying out easier. Baking the fish whole also ensures as much moisture remains in the fish as possible. While there is nothing inherently wrong with pan frying or even deep frying fish (and I love a good fish and chips), baking the fish drastically reduces the amount of oil you are consuming in the recipe and the associated carcinogens from heating oil to high temperatures. Baking haddock in parchment also allows you to infuse the fish with various flavourings you decide to include in the wrapped parcel. Another healthy alternative to baking haddock would be poaching it, which I will cover in a future post. A lot of people are afraid of working with whole fish. You need to clean it, possibly scale the fish, and then fillet the fish if you want to use only the flesh. Cleaning fish is a fairly simple task and can be done very quickly if you know how. If you have never worked with whole fish, make sure to learn how to pick the freshest fish and properly clean/fillet the fish! The benefit to using whole fish is that you get to keep all the leftover goodies. 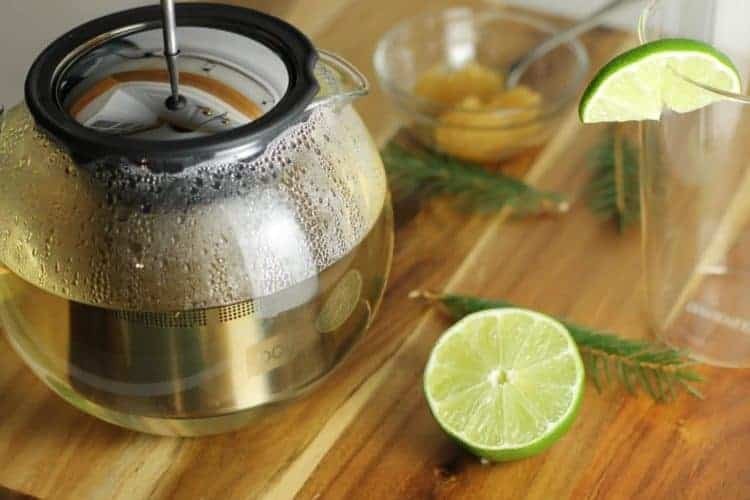 If you are trying to save money, you can keep the bones to make fish stock or broth. This can be turned into delicious fish veloute (sauce) or even used in a soup or stew such as a Cioppino. By using the whole fish you are also getting more of the nutrients from the fish in your diet. Being able to use all parts of the fish helps reduce over-consumption and food waste, and is the mark of a truly great home chef! This baked haddock recipe is foolproof and is one I actually used during an exam while at Culinary School. 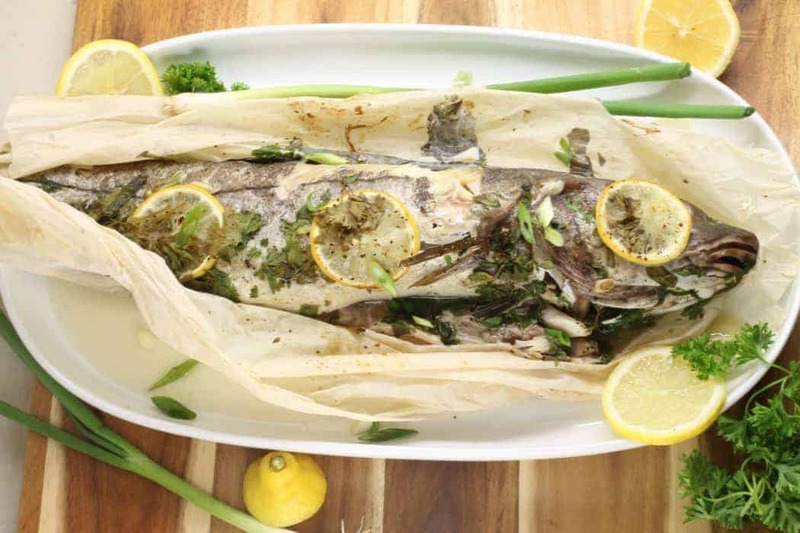 The end product is a flaky moist fish, packed with flavour from the wine, lemon, and herbs. Simplicity is key here as you want to try and preserve as much of the natural haddock flavour as possible. Start by cleaning your haddock. You can choose to keep the fish whole, head, tail, skin and all, or filleting the fish and using just the flesh. Don’t worry if you choose to keep the fish whole, once baked the skin will peel right of and the meat will separate very easily from the bones. Season the inside cavity of the haddock, by rubbing it with a little olive oil, followed by salt and fresh ground pepper. You can also lay a few sprigs of dill or parsley and a slice of lemon inside if you like. 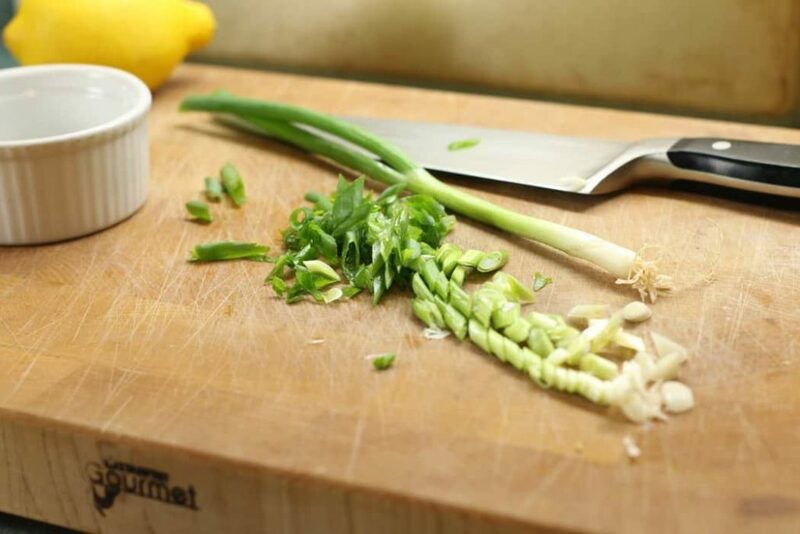 Lay the fish on the parchment paper, sprinkle some green onions and parsley, and place a few slices of lemon on top. Then wrap the fish up as you would a present. Make sure to properly fold over all the edges to ensure no steam or liquid will escape as the fish bakes. Place the wrapped haddock in a casserole dish or deep sheet pan and place in a preheated oven. Use a dish with deep sides in case any liquid does escape. Bake the haddock for half an hour at 375F. Once finished, remove the dish from the oven, and carefully pierce the parchment with a knife. Hot steam will escape, so be careful not to burn yourself. Using a ladle scoop out any liquid that may be in the bottom of the parcel, then using a dash of water and potato or cornstarch, thicken the liquid to create a light sauce. If you have any fish broth or stock from a previous meal, use that to stretch the sauce and make a larger batch. With the haddock fully baked, use a paring knife to peel back the skin. You should be able to lift sections of the fillet right off the bone. Serve on top of rice, garnished with a sauce made from the drippings and a little bit of fresh chopped parsley. If you liked this recipe add it to your recipe box by hitting the yummly button above! You can also follow me on Facebook, Pinterest, Instagram and Twitter to find out what I’m up to each week! A super simple parchment baked haddock recipe, this fish stays, moist, flavor packed , and best of all the recipe requires little work! Keyword how do you bake fish in parchment paper?, how long do you bake fish in parchment? Clean the Haddock.You can choose to keep the fish whole, head, tail, skin and all, or filleting the fish and using just the flesh. If keeping the fish whole wash under clean water. Season the haddock inside and out, with a little olive oil, salt and fresh ground pepper. Lay a few sprigs of dill or parsley and a slice of lemon inside if you like. Season the outside of the fish as well. Lay the fish on the parchment paper and wrap the fish up as you would a present.Splash the wine over top of the fish. Make sure to properly fold over all the edges to ensure no steam or liquid will escape as the fish bakes. Place the wrapped haddock in a casserole dish or deep sheet pan and place in a preheated oven at 375F for 30 to 40 minutes. Remove the dish from the oven, and carefully pierce the parchment with a knife. Hot steam will escape, so be careful not to burn yourself. Serve on rice or with salad. Baking fresh haddock in parchment ensures the fish remains moist & all the flavour stays in the dish. An easy beginner recipe, perfect for a simple supper. I have always been intimidated to cook a whole fish, but this makes it look quite simple. Can’t wait to try it! I grew up eating haddock on the east coast–one of my favorite fish. And I always appreciate simple fish preparations that celebrate it. Lucky you to have access to such fresh whole fish! Great post! Makes me want to make whole fish! I never have but reading the post gives me to confidence to try. Great post, Markus! I have cooked plenty of fillets in parchment, but never a whole fish, and I don’t know why, after reading this! I need to do it soon. Thanks for sharing. There is always something so very intriguing about the presentation of a “whole” fish. This is the perfect way to do it as well. I have only tried this technique once, on single portions sizes. I think I need to give it a try again. It works beautifully on single fish fillets aswell! I would just reduce the cooking time to 12 o 15 minutes depending on the size( 6 to 8 ounces). Yeah boy! This recipe makes me so happy, Markus! 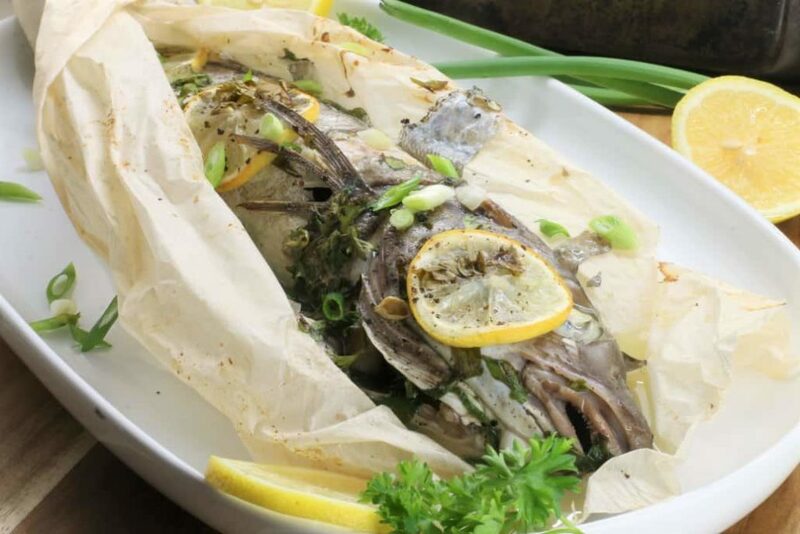 I love fish en papillote and I’ve been meaning to make it/create a how-to and I. keep. forgetting. This has really inspired me to get on that, though. Isn’t it amazing how simple you can keep things and how tasty of a sauce you get simply from all those juices? You’re so much more advanced than I, cooking a whole fish. You could sure teach this pescetarian a few lessons in fish. Haha. The sauce itself is almost as good as the fish! If you have any questions about cooking fish feel free to ask! This is such an informative and evocative piece. Thanks! Thank you very much Sarah! If you’ve never tried baking fish wrapped in parchment I highly suggest it! It’s so tasty!